He completed a 3-year lama retreat in the Karma and Shangpa Kagyu schools of Tibetan Buddhism, and a year-long solitary retreat in the Chogling Tersar practice lineage held by Tulku Urgyen. 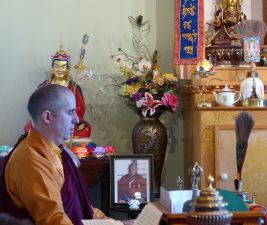 Over the past 20 years he has traveled far and wide, teaching and working with and translating for a great number of distinguished Nyingma and Kagyu meditation masters, such as helping Trangu Rinpoche establish the monastic retreat program at Gampo Abbey in Cape Breton, Nova Scotia in the early 1990s; helping Kenpo Sonam Topgyal Rinpoche re-establish the vajrayana Buddhist tradition for the Chinese community in Thailand in the mid-1990s; and working closely with his precious teacher, His Holiness Orgyen Kusum Lingpa, to advance many philanthropic projects in Tibet dedicated to world peace. Tulku Sherdor is renowned as a scholar and interpreter of Tibetan Buddhist teachings into English, and known for his quiet yet humorous and insightful manner. The following is a partial list of dharma transmissions and instructions Tulku Sherdor has received, predominantly in the original Tibetan language. Mipham's commentary "White Lotus" on the seven-line prayer to Guru Rinpoche, separately from Dungsay Thinley Norbu Rinpoche and from Riwoche Khenpo Sonam Topgyal. Empowerment and instruction in both main traditions of Kalachakra from HH Dalai Lama (2 times), from Kyabje Kalu Rinpoche, and from HH Orgyen Kusum Lingpa. Karma Lingpa's extensive Shi Tro (Peaceful and Wrathful mandala) empowerment from Kyabje Kalu Rinpoche and from HH Orgyen Kusum Lingpa. Jigme Lingpa's dzog chen guidebook "Yeshe Lama" from HH Orgyen Kusum Lingpa, with reading transmission and repeated instructions on many topics over many years. Upadesa (men ngag) oral instructions on Dzog Chen, including pointing out instructions, from Kyabje Tulku Urgyen Rinpoche many times, from HH Orgyen Kusum Lingpa many times, from Kunzang Dechen Lingpa several times, from Chokyi Nyima Rinpoche many times, and from other realized Lamas. Countless empowerments, instructions and transmissions in the Karma Kagyu lineage from the Gyalwa Yabsay, from Kalu Rinpoche, from Bhokar Rinpoche, Khenchen Trangu Rinpoche, Tenga Rinpoche, Surmang Karma Senge Rinpoche, Lagen Sanjay Tenzin Rinpoche, and others. All empowerments and instructions for the traditional 3 year 3 month retreat personally from Kyabje Kalu Rinpoche, some twice (1982 and 1986). Numerous empowerments, instructions and reading transmissions in the Zab Tig, Bar Chay Kun Sel, Kunzang Tug Tig and other cycles of the Chogling Tersar from Kyabje Tulku Urgyen Rinpoche, Tsikay Chogling Rinpoche, Lama Pudzay, and others. Complete Empowerments in the 13 mandalas of the Longchen Nyingtig cycle several times from HH Orgyen Kusum Lingpa. Teachings and Empowerments from His Holiness Dodrupchen Rinpoche and Tulku Teglo in the Longchen Nyintig tradition. Several hundred empowerments in the treasure teachings of HH Orgyen Kusum Lingpa, and related practice instructions. Transmission and instruction in Dudjom Treasure preliminaries from Lama Thubten Phuntsog Rinpoche, along with numerous upadesa instructions drawn from Shakya Sri, Paltrul Rinpoche and others. Rigpa Tsal wang numerous times from HH Orgyen Kusum Lingpa. Instruction on Mahamudra Prayer, the five treasures of Maitreya, practice manuals of Karma Chagme and Jamgon Kongtrul, and on Shentong and Rangtong Madhyamaka from Khenpo Tsultrim Gyamtso Rinpoche. Instructions on all the main practices of Karma Kagyu and Shangpa Kagyu from Lama Norlha. Karma Chagme's bardo manual from Khenpo Sonam Topgyal, Karma Lingpa's instruction lineage on bardo and many other bardo teachings from HH Orgyen Kusum Lingpa. Madhyamaka instruction at Naropa Institute and U. of Virginia. Complete Longchen Nyingtig ngon dro instructions, including Kunzang Lama'i Shal Lung, from HH Orgyen Kusum Lingpa and others many times. Empowerments from Longsel Nyingpo's treasures in Tibet from Katog Moktsa Rinpoche, head of Katog Monastery. Empowerments and instructions in the Jang Ter (Northern Treasure) lineage from Taklung Tsetrul Rinpoche, holder of the lineage. Special "Living Powa" transmission from HH Orgyen Kusum Lingpa many times. Je Nang personal blessing and transmission from HH Orgyen Kusum Lingpa to teach what he bestowed. Isolated teachings and empowerments from many other accomplished masters as Tendrel, e.g. from HH Sakya Trizin, instruction on Paltrul Rinpoche's tsig sum nedeg teachings of Garab Dorje from Lama Wangdor. Khandro Nyingtig empowerment and complete instructions from Dungsay Rigdzin Dorje. A cup of wisdom amrita and a penetrating scolding from Dungsay Thinley Norbu Rinpoche. Empowerments and instructions in Drikung Kagyu lineage from Khenchen Konchog Gyaltsen and HH Drikung Chetsang Rinpoche. Yerpa Kagyu empowerment and instructions on Dorje Drollod from Tana Tulku. Dharma teachings from Dilgo Khyentse Rinpoche, Chadral Rinpoche, Yonge Mingyur Rinpoche, Namkha'i Norbu Rinpoche, Sogyal Rinpoche, Khenpo Karthar Rinpoche, Khetsun Zangpo Rinpoche, Lama Tsewong Puntsog, and other qualified teachers. Vipassana meditation instructions in the Theravada tradition from Christopher Titmuss, Jack Kornfield, Joseph Goldstein and Munindra-ji. The above list does not include any of the practice manuals, guide books, spiritual biographies and treatises he has studied independently in the Tibetan language, such as the Lamrim Yeshe Nyingpo root text and commentary by Jamgon Kongtrul Lodro Thaye, the extensive commentary by Situ Panchen Chokyi Jungnay and other commentaries on the Mahamudra Prayer of Karmapa Rangjung Dorje, Vimalamitra's and other commentaries on the Jampal Tsenjod (Extolling the Qualities of Manjusri), Taranatha's and other commentaries on the Heart Sutra, among many others. Nor does it include any of the hundreds of translations of dharma texts or original dharma teachings published in English that he has read.